An Apsara (also spelled as Apsarasa) is a female spirit of the clouds and waters in Hindu and Buddhist mythology. Apsaras represent an important motif in the stone bas-reliefs of the Angkorian temples in Cambodia (8th–13th centuries AD), however all female images are not considered to be apsaras. In harmony with the Indian association of dance with apsaras, Khmer female figures that are dancing or are poised to dance are considered apsaras; female figures, depicted individually or in groups, who are standing still and facing forward in the manner of temple guardians or custodians are called devatas. Angkor Wat, the largest Angkorian temple (built AD 1116–1150), features both apsaras and devata, however the devata type are the most numerous with more than 1,796 in the present research inventory. Angkor Wat architects employed small apsara images (30–40 cm as seen at left) as decorative motifs on pillars and walls. They incorporated larger devata images (all full-body portraits measuring approximately 95–110 cm) more prominently at every level of the temple from the entry pavilion to the tops of the high towers. In 1927, Sappho Marchal published a study cataloging the remarkable diversity of their hair, headdresses, garments, stance, jewelry and decorative flowers, which Marchal concluded were based on actual practices of the Angkor period. Some devata appear with arms around each other and seem to be greeting the viewer. “The devatas seem to epitomize all the elements of a refined elegance,” wrote Marchal. 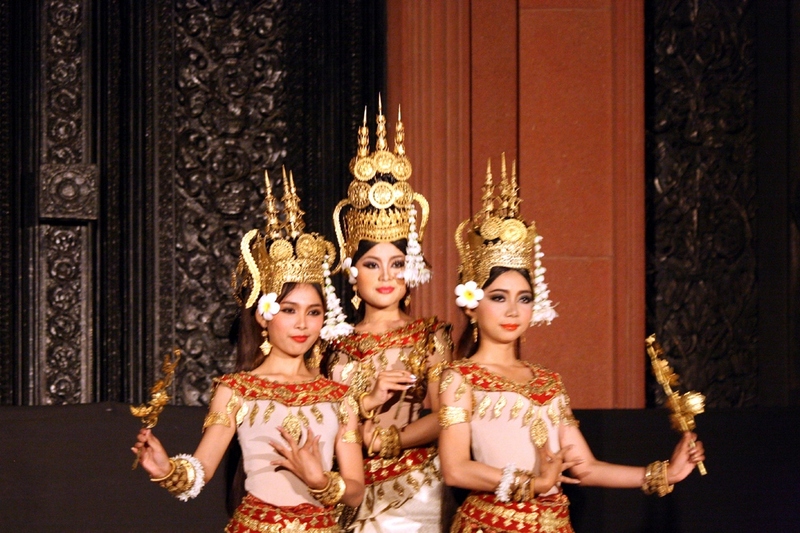 Khmer classical dance, the indigenous ballet-like performance art of Cambodia, is frequently called “Apsara Dance”. Apsaras were also an important motif in the art of Champa, medieval Angkor’s neighbor to the east along the coast of what is now central Vietnam. Especially noteworthy are the depictions of apsaras in the Tra Kieu Style of Cham art, a style which flourished in the 10th and 11th centuries AD.